This procedure involves inserting a small telescope known as a laparoscope through the abdominal wall when the pelvic organs can be clearly seen. A laparoscopy is performed in the operating theatre, usually as a day-case under a general anaesthetic. 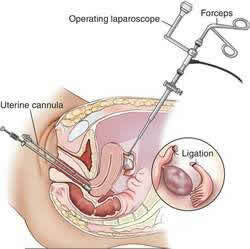 Laparoscopy is performed to inspect the uterus, tubes and ovaries for the presence of adhesions. Other pelvic problems such as Hydrosalpinx, Pelvic TB, Endometriosis and Fibroid can also be detected.